In an unusual move, the president of the west African state of Sao Tome and Principe has boycotted his own run-off election, handing victory to his rival. Manuel Pinto da Costa withdrew from Sunday's poll, alleging fraud in the first round held on 17 July. 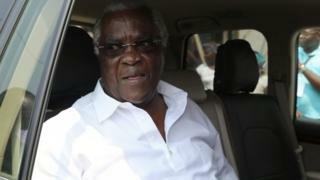 His rival Evaristo Carvalho, a former prime minister, is now certain to win the race. He had won the first round with 49.8% of the vote while Mr Pinto da Costa had taken 24.8%. Ahead of Sunday's run-off, he had called on his supporters not to vote, and later reports said many of them had stayed away. Mr Pinto da Costa ruled Sao Tome with an iron fist for the first 15 years after independence from Portugal in 1975. He lost the presidency after introducing reforms in 1990, including multi-party democracy, but in 2011, he was re-elected to office. Sao Tome and Principe, a former Portuguese colony, consists of two islands of volcanic origin and a number of smaller islets lying off the western coast of Africa.